With Nirvana’s Nevermind celebrating its 25th anniversary yesterday, this has naturally caused a lot of people to wonder what ever became of the baby who posed on the record’s cover. This weekend, we’ve learned that Spencer Elden is an artist living in Los Angeles. Even though Elden is more into the Clash than Nirvana these days, as you can see in the photo below, he’s still proud enough of his place in music history to have the album’s name tattooed across his chest. And he knows that it’s something with which he’s always going to be associated. Elden’s parents were paid $200 by photographer Kirk Weddle at a shoot that lasted approximately 15 seconds. 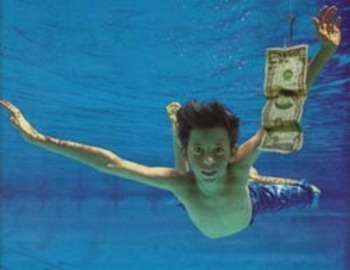 Nevermind has sold more than 10 million copies in the U.S. on the strength of hit singles like "Smells Like Teen Spirit" and "Come As You Are." John Chapple, who took the photo this year, paid him another $200. In addition to recreating the pose this year, Elden has also done it in 2011, 2008 and 2001.